Binary stars are common throughout the galaxy, as it has been estimated about half the stars in our sky consist of two stars orbiting each other. Therefore, it’s also thought that about half of all exoplanet host stars are binaries as well. However, only about 10 of these so called circumbinary planets have been found so far in the 3,000-plus confirmed extrasolar planets that have been discovered. But chalk up one more circumbinary planet, and this one bodes well for a technique that could help scientists find planets that orbit far away from their stars. 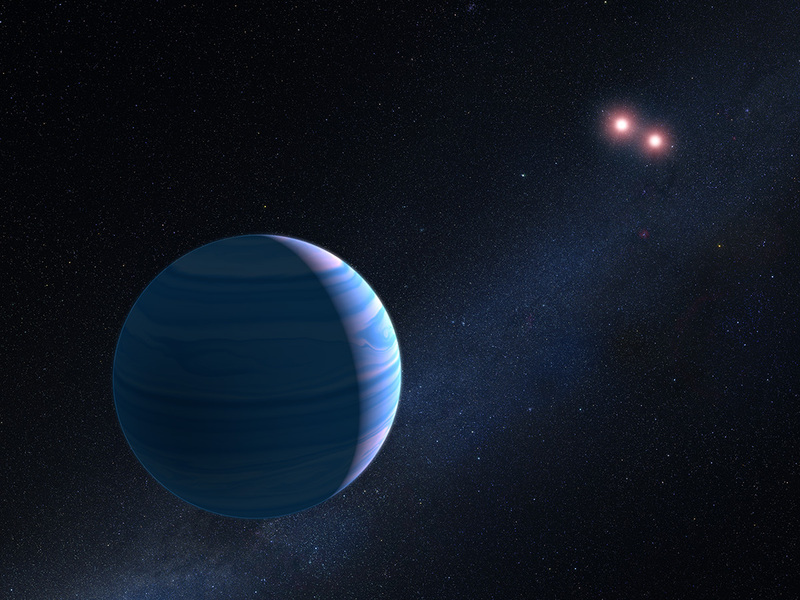 Astronomers using the Hubble Space Telescope have confirmed a very interesting “three-body” system where two very close stars have a planet that orbits them both at a rather large distance. The two red dwarf stars are just 7 million miles apart, or about 14 times the diameter of the Moon’s orbit around Earth. The planet orbits roughly 300 million miles from the stellar duo, about the distance of the asteroid belt from the Sun. The planet completes an orbit around both stars roughly every seven years. 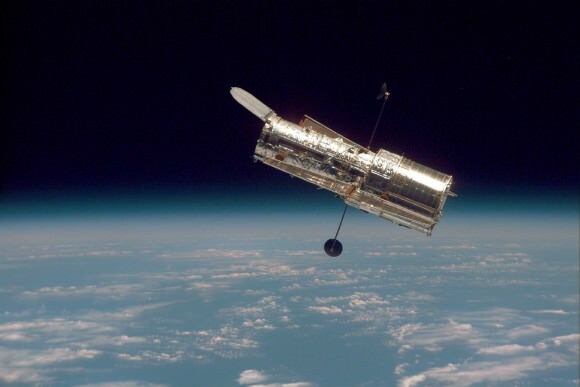 Hubble used the a technique called gravitational microlensing, where the gravity of a foreground star bends and amplifies the light of a background star that momentarily aligns with it. The light magnification can reveal clues to the nature of the foreground star and any associated planets. The system, called OGLE-2007-BLG-349, was originally detected in 2007 by the Optical Gravitational Lensing Experiment (OGLE), a telescope at the Las Campanas Observatory in Chile that searches for and observes microlensing effects from small distortions of spacetime, caused by stars and exoplanets. However, the original OGLE observations could not confirm the details of the OGLE-2007-BLG-349 system. OGLE and several other ground-based observations determined there was a star and a planet in this system, but they couldn’t positively identify what the observed third body was. “The ground-based observations suggested two possible scenarios for the three-body system: a Saturn-mass planet orbiting a close binary star pair or a Saturn-mass and an Earth-mass planet orbiting a single star,” said David Bennett, from NASA’s Goddard Space Flight Center, who is the first author in a new paper about the system, to be published in the Astrophysical Journal. With Hubble’s sharp eyesight, the research team was able to separate the background source star and the lensing star from their neighbors in the very crowded star field. The Hubble observations revealed that the starlight from the foreground lens system was too faint to be a single star, but it had the brightness expected for two closely orbiting red dwarf stars, which are fainter and less massive than our sun. “OGLE has detected over 17,000 microlensing events, but this is the first time such an event has been caused by a circumbinary planetary system,” explains Andrzej Udalski from the University of Warsaw, Poland, co-author of the study and leader of the OGLE project. The team said this first-ever confirmation of an exoplanet system using the gravitational microlensing technique suggests some intriguing possibilities. While data from the Kepler Space Telescope is more likely to reveal planets that orbit close to their stars, microlensing allows planets to be found at distances far from their host stars. “This discovery, suggests we need to rethink our observing strategy when it comes to stellar binary lensing events,” said Yiannis Tsapras, another member of the team, from the Astronomisches Recheninstitut in Heidelberg, Germany. “This is an exciting new discovery for microlensing”. The team said that since this observation has shown that microlensing can successfully detect circumbinary planets, Hubble could provide an essential new role in the continued search for exoplanets. OGLE-2007-BLG-349 is located 8,000 light-years away, towards the center of our galaxy.